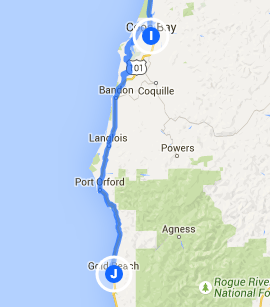 Trip Log – Day 132 – Coos Bay, OR to Gold Beach, OR | How Will We Live Tomorrow? The pattern of clouds and sun on the West Coast is opposite what we usually get back East. At home our mornings are often sunny, but once the clouds arrive, they stay. Here, mornings are often cloudy but can evaporate to bright sun later in the day. 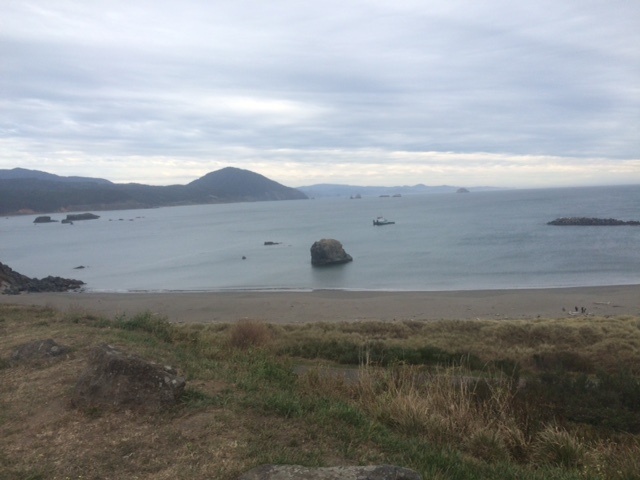 Today was cloudy from the start and stayed that way until late afternoon. Then the sun came out for a gorgeous sunset and a night sky was full of stars. It was overcast the entire time I cycled; the first time that I kept my windbreaker on all day. 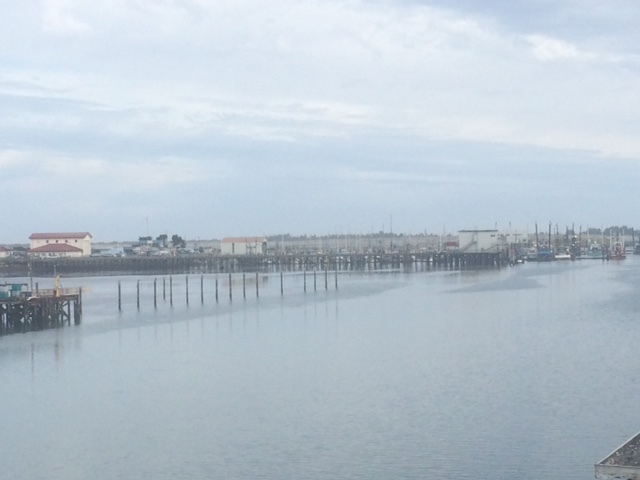 I took the coast road out of Coos Bay through Charleston, a picturesque fishing village that appreciates the fourth food group. 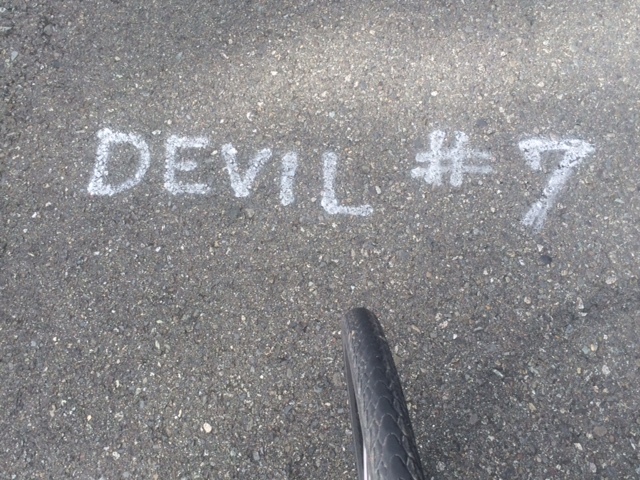 I climbed Seven Devil’s Road, so named because it has seven steep climbs, marked on the pavement for cyclists. Between climb five and six the road stays high above the trees for several miles. Even on a cloudy day, the view west reveals rows of distant mountains. 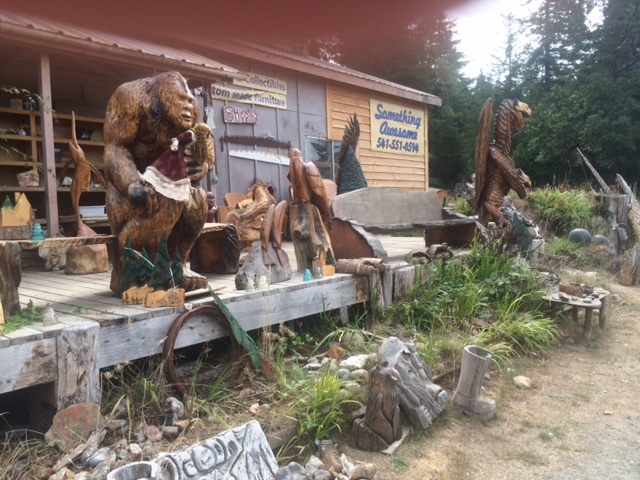 Between Bandon and Port Orford, US 101 tucks inland and passes all variety of vacation kitsch. 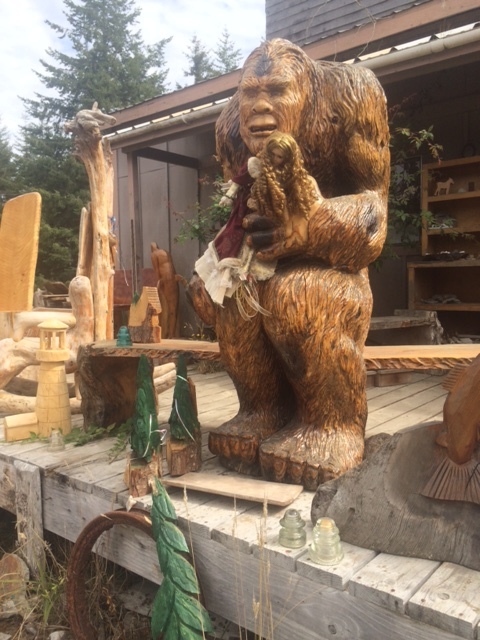 I was intrigued by all of the chainsaw wood carving places and stopped at Something Awesome, which had some of the best supersize wood sculptures. Not sure who buys them or where they get displayed, but they sure are fun. 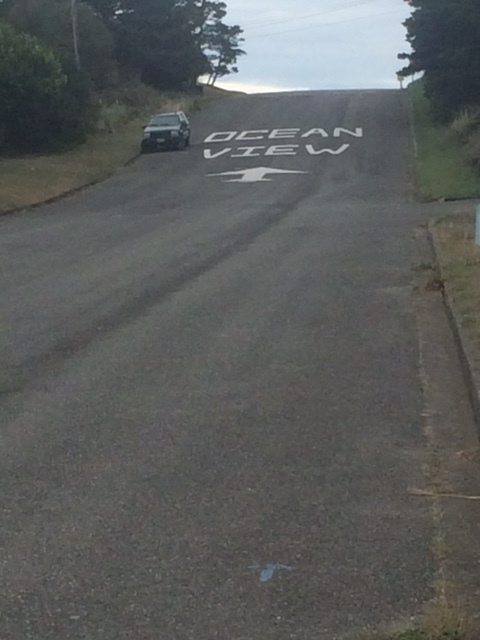 After a terrific lunch break at TJ’s Cafe in Port Orford I couldn’t help but climb the sign and arrow painted on the road. 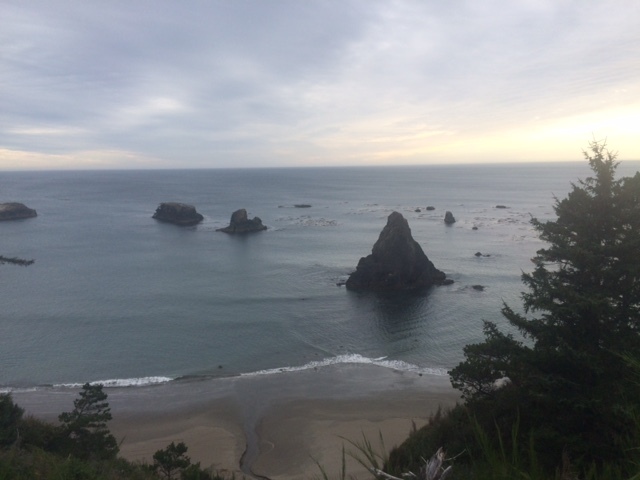 At the top of the hill – bam – the ocean that I had not seen for a few hours spread out before me. 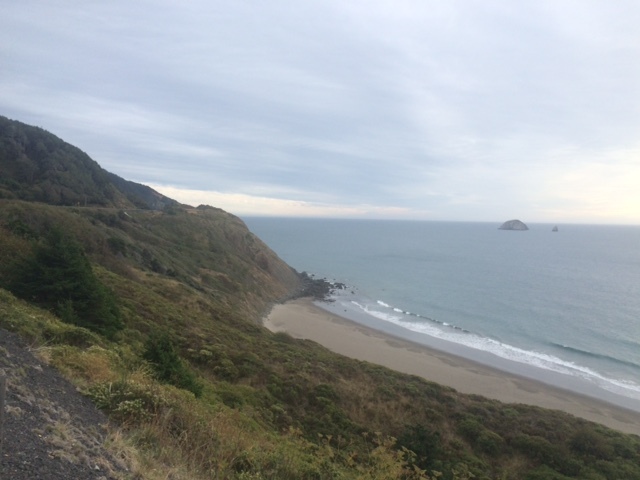 The last fifteen miles along the coast and around the base of Humbug Mountain were gorgeous. The lowering sun dazzled the water. 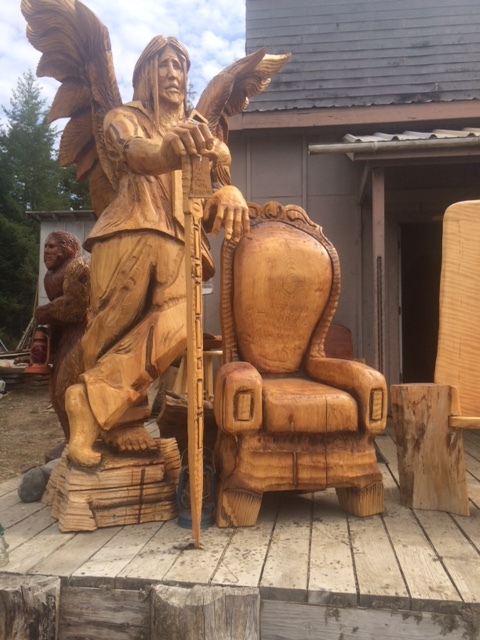 I overshot the turnoff to my friend Paul Hempel’s house, but hardly minded because the view of Humbug coming back north was incredible. Turns out, Paul and his husband Bruce’s house is on a hill with deadeye views of Humbug, so I got the see the sun play off the mountain and the sea for several twilight hours. Bruce and Paul have a fascinating house and shop with gardens and pools. Paul retired recently and has taken to being a gentlemen farmer very well. 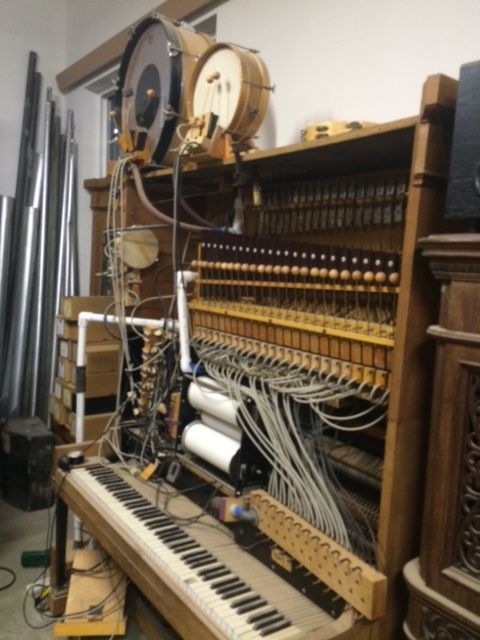 Bruce is a renowned restorer of player pianos and orchestrions. If you don’t know what that is, neither did I, but hearing a technical device play six or eight different instruments is a delight. 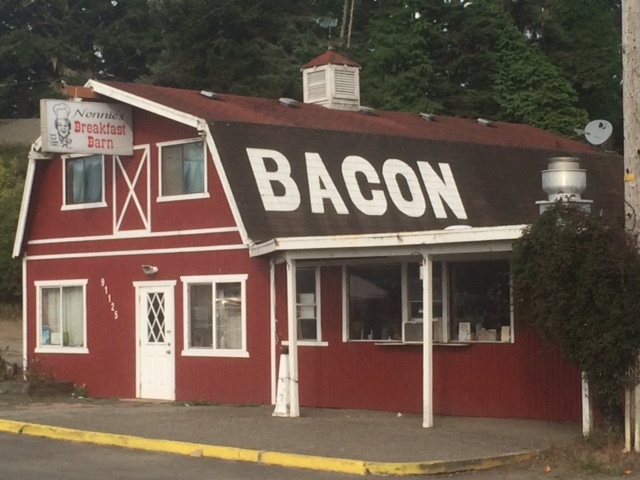 This entry was posted in Bicycle Trip Log and tagged bacon, Coos Bay OR, Gold Beach OR, orchestrion, Port Orford OR, Seven Devil's Road, TJ's Cafe, US 101. Bookmark the permalink.